Eastin, J. D., D. Jones, D. Dux, and H. E. Egger. 1998. Binder containing plant protein and densified refuse fuel cubes made using same and methods of making them. Patent Number: 5,763,509. Date of Patent: June 9, 1998. 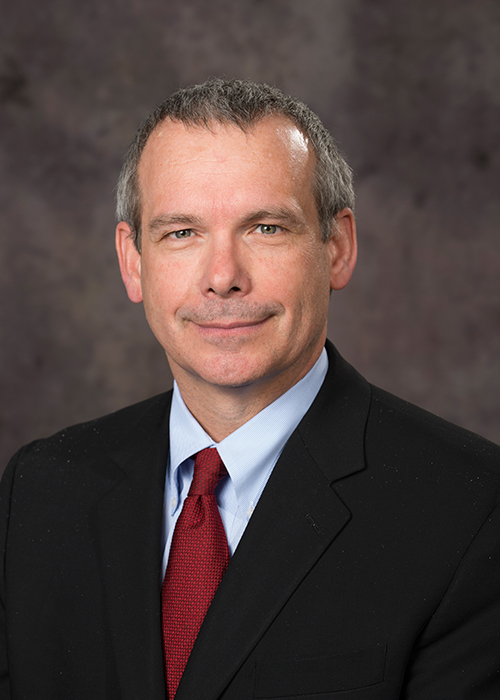 David Jones was named interim department head for Biological Systems Engineering in June 2017. He previously served as associate dean for Undergraduate Programs for the College of Engineering beginning in August 2011. He oversaw the college’s undergraduate studies and student services, along with curriculum, assessment and outreach. He is also a professor of Biological Systems Engineering and a courtesy professor in the Food Science & Technology Department. Jones has been honored with a Presidential Citation from the Institute of Biological Engineers, as well as multiple University of Nebraska-Lincoln awards for his teaching, advising and mentoring. His teaching interests are transport processes, freshman engineering, mathematical modeling, and senior capstone engineering design. In 2015, he was chosen as one of six Nebraska faculty to participate in a two-year federal program funded by the National Science Foundation to boost innovation and entrepreneurship in undergraduate engineering education. Jones also led UNL’s Strengthening Transitions to Engineering Programs (S.T.E.P. ), funded by the National Science Foundation. He worked with community colleges to enhance pathways for students transferring to the College of Engineering. He earned his Ph.D. in Agricultural Engineering from Oklahoma State University-Stillwater; his M.S. and B.S. in Agricultural Engineering are from Texas A&M University. Chen, J., K. Pitchai, S. Birla, D. Jones, M. Negahban, and J. Subbiah. 2016. Modeling heat and mass transport during microwave heating of frozen food rotating on a turntable. ELSEVIER. Food and Bioproducts Processing, 99: 116-127. Pitchai, K., J. Chen, S. Birla, D. Jones, and J. Subbiah. 2016. Modeling microwave heating of frozen mashed potato in a domestic oven incorporating electromagnetic frequency spectrum. ELSEVIER. Journal of Food Engineering, 173: 124-131. Pitchai, K., J. Chen, S. Birla, D. Jones, R. Gonzalez, and J. Subbiah. 2015. Multiphysics modeling of microwave heating of a frozen heterogenous meal rotating on a turntable. Institute of Food Technologists. Journal of Food Science, 80(12): E2803-E2814. Naganathan, G. K., K. Cluff, A. Samal, C. R. Calkins, D. D. Jones, G. E. Meyer, and J. Subbiah. 2015. Three dimensional chemometric analyses of hyperspectral images for beef tenderness forecasting. ELSEVIER. Journal of Food Engineering, 169: 309-320. Naganathan, G. K., K. Cluff, A. Samal, C. R. Calkins, D. D. Jones, C. L. Lorenzen, and J. Subbiah. 2015. Hyperspectral imaging of ribeye muscle on hanging beef carcasses for tenderness assessment. ELSEVIER. Computers and Electronics in Agriculture, 11655-11664. Chiang, J., S. Birla, M. Bedoya, D. Jones, J. Subbiah, and C. Brace. 2015. Modeling and validation of microwave ablation with internal vaporization. IEEE Transactions on Biomedical Engineering, 62(2):657-663. Chen, J., K. Pitchai, S. Birla, R. Gonzalez, D. Jones, and J. Subbiah. 2015. Development of a multi-temperature calibration method for measuring dielectric properties of foods. IEEE Transactions on Dielectrics and Electrical Insulation, 22(1):626-634. Naganathan, G. K., K. Cluff, A. Samal, C. R. Calkins, D. D. Jones, C. L. Lorenzen, and J. Subbiah. 2015. A prototype on-line AOTF hyperspectral image acquisition system for tenderness assessment of beef carcasses. ELSEVIER. Journal of Food Engineering, 154: 1–9. Chen, J., K. Pitchai, S. Birla, D. Jones, and J. Subbiah. 2015. Effect of decoupling electromagnetics from heat transfer analysis on prediction accuracy and computation time in modeling microwave heating of frozen and fresh mashed potato. Journal of Food Engineering, 144:45-57. Chen, J., K. Pitchai, S. Birla, M. Negahban, D. Jones, and J. Subbiah. 2014. Heat and mass transport during microwave heating of mashed potato in domestic oven – model development, validation, and sensitivity analysis. Journal of Food Science, 79(10):1991-2004. Pitchai, K., J. Chen, S. Birla, R. Gonzalez, D. Jones, and J. Subbiah. 2014. A microwave heat transfer model for a rotating multi-component meal in a domestic oven: development and validation. Journal of Food Engineering, 128:60-71. Kumar, A., D. Jones, and M. Hanna. 2009. Thermochemical biomass gasification: a review of current status of technology. Energies, 2(3):556-581. Wang, L., M. A. Hanna, C. Weller, and D. Jones. 2009. Technical and economical analyses of combined heat and power generation from distillers grains and corn stover in ethanol plants. Energy Conversion and Management, 50(7):1704-1713. Wang, L., A. Kumar, M. A. Hanna, C. L. Weller, and D. Jones. 2009. Thermal degradation kinetics of distillers grains in nitrogen and air. Energy Sources, Part A: Recovery, Utilization, and Environmental Effects, 31(10):797-806. Kumar, A., K. Eskridge, D. Jones, and M. A. Hanna. 2009. Steam-air fluidized bed gasification of distillers grains: effects of steam to biomass ratio, equivalence ratio and gasification temperature. Bioresource Technology, 100(6):2062-2068. Wang, L., C. Weller, and D. Jones. 2009. Contemporary issues in thermal gasification of biomass and its application to electricity and fuel production. Biomass and Bioenergy, 32(7):573-581. Lee, S. Y., M. A. Hanna, and D. Jones. 2008. An adaptive neuro-fuzzy inference system for modeling mechanical properties of tapioca starch-poly (lactic acid) nanocomposite foams. Starch, 60:159-164. Kumar, A., L. Wang, D. Yuris, D. Jones, and M. A. Hanna. 2008. Thermogravimetric characterization of corn stover as gasification/pyrolysis feedstock. Biomass and Bioenergy, 32:460-467. Miller, D., C. Nelson, D. Oleynikov, and D. Jones. 2008. Pre-operative ordering of minimally invasive surgical tools: a fuzzy inference system approach. Artificial Intelligence in Medicine, 43:35-45. Kumar, A., G. M. Ganjyal, D. Jones, and M. A. Hanna. 2008. Modeling residence time distribution in a twin-extruder as a series of ideal steady-state flow reactors. Journal of Food Engineering, 84:441-448. Keshwani, D. R., D. D. Jones, G. E. Meyer, and R. M. Brand. 2007. Rule-based Mamdani-type fuzzy modeling of skin permeability. Applied Soft Computing (Elsevier). 8:285-294. Sethuramasamyraja, B., V. I. Adamchuk, D. B. Marx, A. Dobermann, G. E. Meyer, and D. Jones. 2008. Analysis of an ion selective electrode based methodology for integrated on the go mapping of soil pH, potassium, and nitrate contents. Transactions of the ASABE, 50(6):1927-1935. Sethuramasamyraja, B., V. I. Adamchuk, D. B. Marx, A. Dobermann, G. E. Meyer, and D. Jones. 2007. Agitated soil measurement method for integrated on-the-go mapping of soil pH, potassium and nitrate contents. Computers and Electronics in Agriculture, 60:212-225. Kumar, A., G. M. Ganjyal, D. Jones, and M. A. Hanna. 2007. Experimental determination of longitudinal expansion during extrusion of starches. Cereal Chemistry, 84(5):480-484. Kumar, A., G. M. Ganjyal, D. D. Jones, and M. A. Hanna. 2006. Digital image processing for measurement of residence time distribution in a laboratory extruder. Journal of Food Engineering (Elsevier), 75:237-244. Wang, L., D. Jones, C. Weller, and M. Hanna. 2006. Modeling of transport phenomena and melting kinetics of starch in a co-rotating twin-screw extruder. Advances in Polymer Technology (Wiley Periodicals, Inc.), 25:22-40. Ganjyal, G., M. A. Hanna, P. Supprung, A. Noomhorm, and D. Jones. 2006. Modeling selected properties of extruded rice flour and rice starch by neural networks and statistics. Cereal Chemistry (AACC International, Inc.), 83:223-227. Brand, R. M., D. D. Jones, H. T. Lynch, R. E. Brand, P. Watson, R. Ashwathnayaran, and H. K. Roy. 2006. Risk of colon cancer in hereditary non-polyposis colorectal cancer patients as predicted by fuzzy modeling: Influence of smoking. World Journal of Gastroenterology (The WJG Press), 12(28):4485-4491. Neto, J. C., G. E. Meyer, and D. Jones. 2006. Individual leaf extractions from young canopy images using Gustafson—Kessel clustering and a genetic algorithm. Computers and Electronics in Agriculture, 51:66-85. Neto, J. C., G. Meyer, D. D. Jones, and A. J. Surkan. 2005. Intensified fuzzy clusters for classifying plant, soil, and residue regions of interest from color images. Computers and Electronics in Agriculture (Elsevier), 42:161-180. Neto, J. C., G. Meyer, D. Jones, and A. K. Samal. 2005. Plant species identification using Elliptic Fourier leaf shape analysis. Computers and Electronics in Agriculture. 50(2005):121-134. Wang, L., G. Ganjyal, D. Jones, C. Weller, and M. Hanna. 2005. Modeling of bubble growth dynamics and nonisothermal expansion in starch-based forms during extrusion. Advances in Polymer Technology (Wiley Periodicals, Inc.), 24:29-45. Brown-Brandl, T. M., D. D. Jones, and W. E. Woldt. 2005. Evaluating modeling techniques for livestock heat stress prediction. Biosystems Engineering (Elsevier), 91:513-524. Keshwani, D. R., D. D. Jones, and R. M. Brand. 2005. Takagi-Sugeno Fuzzy Modeling of skin permeability. Cutaneous and Ocular Toxicology (Taylor & Francis), 24:149-163. Neto, J. C., G. E. Meyer, and D. D. Jones. 2005. Individual leaf extractions from young canopy images using Gustafson--Kessel clustering and a genetic algorithm. Computers and Electronics in Agriculture (Elsevier), 51(2006):66-85. Wang, L., G. M. Ganjyal, D. D. Jones, C. L. Weller, and M. A. Hanna. 2004. Finite element modeling of fluid flow, heat transfer and melting of biomaterials in a single-screw extruder. Journal of Food Science, 69(5):E212-E223. Meyer, G. E., T. W. Hindman, D. D. Jones, and D. A. Mortensen. 2004. Digital camera operation and fuzzy logic classification of plant, soil, and residue color images. Engineering in Agriculture, 20(4):519-529. Meyer, G. E., J. C. Neto, D. Jones, and T.W. Hindman. 2004. Intensified fuzzy clusters for determining plant, soil, and residue regions of interest from color images. Computers and Electronics in Agriculture, 42(2004):161-180. Ganjyal, G., M. Hanna, and D. Jones. 2003. Modeling selected properties of extruded waxy maize cross-linked starches with neural networks. Journal of Food Science, 68(4):1384-1388. Koopman, A., D. Schulte, D. Jones, and B. Tieszen. 2003. Getting from anecdotal to real info. In: Engineering Education: Visions of Century II, Conference Proceedings, ASEE Midwest Section 38th Annual Meeting, University of Missouri-Rolla. September 12, 2003. Pannier, A., R. Brand, and D. Jones. 2003. Fuzzy modeling of skin permeability coefficients. Pharmaceutical Research, 20(2):143-148. Merino, G. G., D. Jones, L. D. Clements, and D. Miller. 2003. Fuzzy compromise programming with precedence order in the criteria. Applied Mathematics and Computation, 134(1):184-205. Arumi, J. L., and D. Jones. 2001. Methodology for the analysis of risk analysis of irrigation structures. Hydraulic Engineering in Mexico (in Spanish), 16(3):67- 74. Merino, G. G., D. Jones, D. Stooksbury, and K. G. Hubbard. 2001. Determination of semivariogram models to krige hourly and daily solar irradiance in Western Nebraska. Journal of Applied Meteorology, 40(6):1085-1094. ARD Journal Series No. 12746. Jones, D., and E. M. Barnes. 2000. Fuzzy composite programming to combine remote sensing and crop models for decision support in precision crop management. Agricultural Systems, 65(3):137-158 ARD Journal Series No. 12846. Jones, D., R. Chinnaswamy, Y. Tan, and M. Hanna. 2000. Physiochemical properties of ready-to-eat breakfast cereals. Cereal Foods World, 45(4):164-168. ARD Journal Series No. 10067. Merino, G. G., D. Jones, and L. E. Stetson. 2000. Performance of a grid-connected photovoltaic system using actual and kriged hourly solar radiation. Transactions of the ASAE, 43(4):1011-1018. ARD Journal Series No. 12879. Miller, D. J., C. Nelson, D. Oleynikov, and D. Jones. 2006. A fuzzy inference system for the ordering of laparoscopic tools in minimally invasive surgery. 2006 Summer Bioengineering Conference, Amelia Island, Florida. BIO2006-156583, June 21-25. Schulte, D., D. Jones, A. Koopmann, and B. Tieszen. 2004. Getting from anecdotal to measured outcomes assessment for out of class experiences. Proceedings of the 2004 American Society for Engineering Education Annual Conference & Exposition. Brown-Brandl, T. M., D. D. Jones, and W. E. Woldt. 2003. Evaluating modeling techniques for livestock heat stress prediction. ASAE Paper Number 034009, July, 2003. Koopman, A., D. Schulte, D. Jones, and B. Tieszen. 2003. Getting from anecdotal to measured outcomes assessment for out of class experiences. In: Engineering Education: Visions of Century II, Conference Proceedings, ASEE Midwest Section 38th Annual Meeting, University of Missouri-Rolla. September 12, 2003. Meyer, G. E., and D. Jones 2003. Thermodynamics of living systems: a fundamental course for biological engineering. The 2003 Annual International Meeting, Institute of Biological Engineering, Athens, GA, January 17-19, 2003. Merino, G. G., F. E. Novoa, and D. Jones. 2002. Fuzzy compromise programming with precedence order in the criteria. XI CLAIO. Congreso Latino Iberoamericano de Investigacion de Operaciones, Concepción-Chile, 27-31 de Octubre de 2002. Lin, X., K. G. Hubbard, D. Jones, and G. Merino, 2002. Fuzzy rule-based approach to evaluate air temperature biases in weather stations. The 13th Conference on Applied Climatology. American Meteorological Society, Page J82-J83. 13-16 May 2002. Portland, Oregon. Jones, D. 2002. Graduate education for the bio-based products industry. American Chemical Society, 223rd National Meeting, Orlando, FL, April 7-11, 2002. Pannier, A. K., Brand, R. M., and Jones, D. 2002. Modeling skin permeability coefficients with fuzzy logic. Perspectives in Percutaneous Penetration. 8:27. Hoffman, G., and D. Jones. 2001. Assessment of senior design experience by clients and consultants. The 2001 Annual International Meeting, Institute of Biological Engineering, Seattle, WA, July 27-29, 2001. Kuhn, G. N., W. E. Woldt, D. D. Jones, and D. D. Schulte. 1996. Solid waste disposal site characterization using non-intrusive electromagnetic survey techniques and geostatistics. In: S. Rouhani, R. M. Srivastava, A. J. Desbarats, M. V. Cromer, and A. I. Johnson (Eds.). ASTM Special Technical Publication 1283, Geostatistics for Environmental and Geotechnical Applications (pp. 162-180). West Conshohocken, PA: American Society for Testing and Materials. Kuhn, G. N., W. E. Woldt, D. D. Jones, and D. D. Schulte. 1995. Solid waste disposal site characterization using non-intrusive electromagnetic survey techniques and geostatistics. In: R. M. Srivastava, S. Rouhani, M. V. Cromer, and A. I. Johnson (Eds.) Geostatistics for Environmental and Geotechnical Applications, ASTM STP 1283. Philadelphia, PA: American Society for Testing and Materials. Von Bargen, K., and D. D. Jones. 1995. A dual-path course in equipment systems. In: J.P. Lunde et al. (Eds.). Reshaping curricula: Revitalization programs at three land grant universities. Bolton, MA: Anker Publishing Company. Wang, L., Kumar, A., Jones, D., and Hanna, M.A. 2007. Co-production of chemical and energy products from distillers grains using supercritical fluid extraction and thermochemical conversion technologies. ASABE meeting presentation, Minneapolis, Minnesota. Paper Number: 076064 June 17-20. Brown-Brandl, T., and D. Jones. 2007. Development and validation of an animal susceptibility model. ASABE Meeting Presentation, Minneapolis, Minnesota. Paper Number: 074081, June 17-20. Brown-Brandl, T., D. Jones, and J. Gaughan. 2006. Modeling the components of livestock stress for precision animal management. ASABE Annual Meeting, Portland, Oregon. Paper No. 064204, July 9-12. Halverson, M.J., D. D. Jones, and D. D. Schulte. 2004. Use of fuzzy set theory to describe annoyance from odors. Presentation at the 2005 Mid-Central ASAE Meeting, St. Joseph, MO. Meyer, G. E., J. C. Neto, D. D. Jones, and T. W. Hindman. 2004. Intensified fuzzy clusters for classifing plant, soil, and residue regions of interest from color images. Computers and Electronics in Agriculture, 42(3):161-180. Neto, J. C., G. Meyer, and D. Jones. 2004. Advances in color image segmentation of plants for weed controls. ASAE Paper Number 043060. Neto, J. C., G. Meyer, D. Jones, and A. J. Surkan. 2003. Adaptive image segmentation using a fuzzy neural network and genetic algorithm for weed detection. ASAE Paper Number 033088. Brown-Brandl, T. M., D. D. Jones, and W. E. Woldt. 2003. Evaluating modeling techniques for livestock heat stress prediction. ASAE Paper Number 034009. Jones, D., and P. Jasa. 1998. Grain cleaners and spreaders. In: Grain Storage, Handling, and Drying In-service Training Manual. Lincoln, NE: University of Nebraska Cooperative Extension. Jones, D., and D. P. Shelton. 1994. Management to maintain stored grain quality. NebGuide G94-1199-A. Lincoln, NE: University of Nebraska Cooperative Extension. Jones, D. D. 1990. Oil additives to reduce grain dust. NebGuide G90-973. Lincoln, NE: University of Nebraska Cooperative Extension. Jones, D. D. 1990. Explosion venting and suppression of bucket elevator legs. NebGuide G90-990. Lincoln, NE: University of Nebraska Cooperative Extension. Jones, D. 1995. A non-intrusive landfill hazard ranking system. Focus on Infrastructure Research, 2(2). Jones, D. 1994. Wads of waste may fuel future. Research Nebraska!, Sept., pp. 8-9. Jones, D. 1994. Tips for managing stored grain through winter. Nebraska Farmer, January, 136(1):36,40. Merino. G., D. Jones, and L. Stetson. 1999. Influence of kriged hourly solar radiation on the performance and economics of a PV-utility hybrid system. ASAE Paper No. 99-4020. 1999 ASAE/CSAE-SCGR Annual International Meeting, Toronto, Canada, July 18-21, 1999. Barnes, E. M., M. G. Baker, P. J. Pinter, Jr., and D. D. Jones. 1998. Integration of remote sensing data and crop models to provide decision support for precision crop management. Presented at the First International Conference on Geospatial Information in Agriculture and Forestry, Orlando, FL, June 6, 1998. Barnes, E. M., P. J. Pinter, Jr., and D. D. Jones. 1998. Integrating remotely sensed data with CRESS-Wheat. 28th Annual Crop Simulation Workshop. Biological Systems Simulation Group, USDA, ARS, Remote Sensing and Modeling Laboratory, Beltsville, MD, April 5-8, 1998. Shelton, D. P., G. R. Bodman, and D. D. Jones. 1998. Using existing buildings for temporary grain storage. In: Stored Grain In-service Training Notebook (3 pp.). Lincoln, NE: University of Nebraska Cooperative Extension. Shelton, D. P., and D. D. Jones. 1998. Management - the key to maintaining stored grain quality. In: Stored Grain In-service Training Notebook (7 pp.). Lincoln, NE: University of Nebraska Cooperative Extension. Shelton, D. P., D. D. Jones, and G. R. Bodman. 1998. Emergency grain storage. In: Stored Grain In-service Training Notebook (5 pp.). Lincoln, NE: University of Nebraska Cooperative Extension. Shelton, D. P., D. D. Jones, and K. J. Jarvi. 1998. Initial condition determines quality of stored grain. In: Stored Grain In-service Training Notebook (3 pp.). Lincoln, NE: University of Nebraska Cooperative Extension. Shelton, D. P., D. D. Jones, and K. J. Jarvi. 1998. Prepare grain bins and equipment for harvest. In: Stored Grain In-service Training Notebook (2 pp.). Lincoln, NE: University of Nebraska Cooperative Extension.